Those of us who live here know that there are two sides to Oklahoma: The pretty side and the ugly side. There is one side to life in my state that is the good side, the side that we want the rest of the nation to see. It’s kind of like your only wanting one side of your face to be photographed because, well, it’s your good side — the pretty side. Tulsa’s enduring sophistication and beauty matched with Oklahoma City’s 20-year run of progress in developing both its new downtown skyline along with the re-purposed Bricktown into a destination entertainment district has impressed many. The various parts of rural and town life Oklahoma are some of the best places to live anywhere considering resources and the cultural variety as you move around the state. Here in Okla homa City, where I live, the rise of various neighborhood mini-centers of activity along with the rustic Bricktown matched with the excitement of Oklahoma City Thunder basketball has been a true joy. I enjoy many of these events and enjoy living in this place. It’s an amazing thing to see, since I have spent most of my life here. It’s not that side of Oklahoma that can defeat us, though. The ugly side surely will, if we let it. Violence-prone, deep-seated racism against blacks left over from our segregation days has been flushed back out into the open by the election and re-election of our first black president. Women are mistreated and disregarded on many levels and in many ways, especially by a legislature made up mostly of white, conservative men who are against “big government” unless it is controlling women’s bodies. Then it is magically a good thing. Our Republican-dominated state government is so dysfunctional that legislators cannot even agree on how to fund repair of an aging Capitol Building that has the smell of sewage from rotting pipes throughout and has to block certain entrances for fear of falling pieces hitting visitors. Welcome to our beautiful state capitol, y’all! The deepest parts of the ugly side are actually hidden, though. Because natural disasters so shape Oklahoma life, we have developed a tendency to see all disaster as “natural”. That provides a large smoke screen for those who have sinister motives. 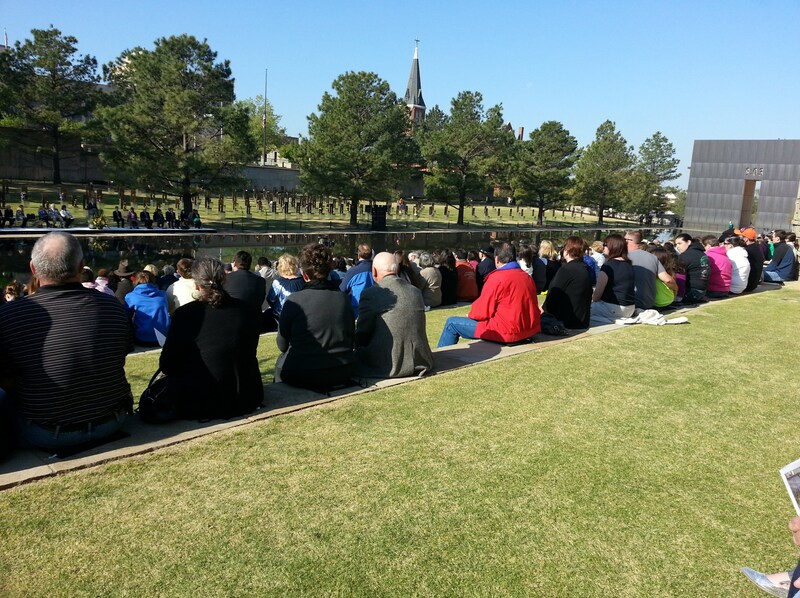 For instance, if you did not know that the 1995 Oklahoma City Bombing was carried out by domestic right-wing extremists, you might not learn that from our yearly remembrances at the memorial service. Speaker after speaker will focus on remembering victims and heroes, carefully navigating around the harsh realities of who perpetrated that heinous crime. It wasn’t a tornado that caused that disaster. Another example of naturalizing the unnatural is how legislators frame the constant cuts as necessary because of not having enough revenue while passing new tax cut measures yearly. Just today in The Oklahoman there is one story about how new measures are being passed to increase education funding that is dependent upon revenues increasing each year. If they don’t increase, then the funding increases won’t go through. Then, just on the opposite page, there is a story about how concerned some legislators are at the impact of proposed tax cuts that are likely to go through. ideologues on the libertarian edges of the Republican Party, big money interests that stand to gain much from lop-sided tax cuts push harder each year for even more cuts, which is the central goal. The benefits to them are easily seen in the chart below and explained here. The result is that GOP legislators are so confidant in the security of their positions that they don’t even try to cover up the illogical bills signed into law even when public opinion is running in the opposite direction. Examples are a ban on local cities and towns passing their own minimum wage, and empowering local traditional utilities to add a surcharge for wind and solar energy. Our ugly side is making it into national news more and more, though. 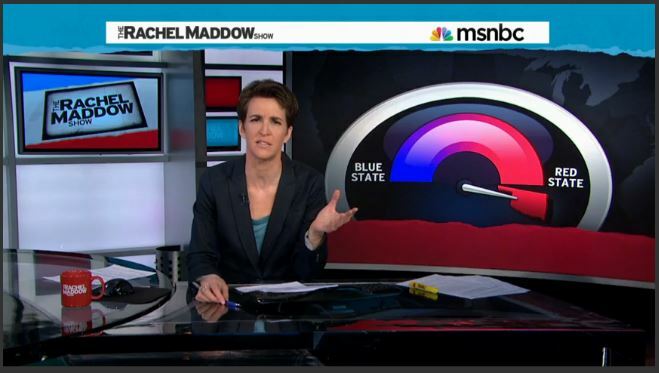 Recently Rachel Maddow featured Oklahoma’s redness as being at the very end — no, off of the end — of a blue to red scale. We were featured as a state that has gone that extra mile to lock down the state with right-wing ideology and favors for those wealthy donors to our Republican politicians. From the Rachel Maddow Show on MSNBC, April 21st, 2014. See the whole clip at the MSNBC website here. Avoid the Man-Made Disasters – Act Now! This is no natural disaster. It is man-made by the designs of a small, wealthy, powerful minority in the shadows. If we allow this to go on, will we have a state made up of well-educated, clear-thinking people who value logical, rather than the most illogical thinking? No, we won’t. It’s time for us to decide that we will not allow the ugly side of Oklahoma to defeat us! 1. Use social media to call out publications and various forms of media that do not report or consider any other view than that of the right wing. 3. Research which corporations are the biggest donors to the leaders of the movement to de-fund public services in Oklahoma and write to their board of directors complaining that their sponsorship of particular politicians are causing a social and educational environment that will harm them in the long run if eventually there is a brain/income drain from the state. iCitizen is an app that is available on iPhone, and Android. It is resourceful in helping you find your reps from top to bottom and showing you their major contributors. 4. Support candidates in this year’s election cycle that challenge the dominant right-wing power structure in the legislature. And support those who are brave enough to run against our well-funded governor. What are some ways that you have found to oppose the weight of the right-wing machine? Please comment.